About a week ago, the New York Times (http://travel.nytimes.com/2008/11/30/travel/30Florence.html ) had an article on Florence. It was interesting because it takes a literary classic, E.M. Forster’s “A Room With a View”, as the central point from which to compare the experience of visiting Florence, how it was back then and how it would be now. The author and books editor of The New York Observer, Adam Begly, goes back and forth between what Lucy experienced over a century ago in Forster’s classic and what a visitor sees and experiences in Florence today. The article points out what to see in Santa Croce (tombs of such greats such as Michelangelo, Galileo and Ghiberti, the Pazzi Chapel and Giotto’s frescoes), how the tours have changed (the guides now often talk into a microphone which is transmitted to the groups’ earphones), and the beauty and calm that can make anyone fall in love with the place. Not without first pointing out that Santa Croce’s facade is still ugly, the long square in front of it bland and infested with pigeons and full of tourists! Of course, the article is written by a book editor so it focuses on places visited and seen by Forster, and experienced by Lucy in the book. It is still important to focus on the simple and elegant harmony present throughout Renaissance Florence, focus on loitering over lunch and dinner and not try to cram too much sightseeing into every day you are here. 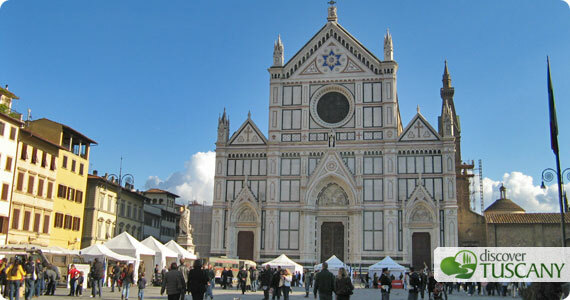 While I personally find Santa Croce’s black and green marble exterior geometric look pleasing, I found myself agreeing with Begly that it is still possible to enjoy a relaxing visit to Florence today just as Forster and Lucy managed to do back then, when even they complained about the amount of tourists!